"I Am I Am I Am is a gripping and glorious investigation of death that leaves the reader feeling breathless, grateful, and fully alive. Maggie O’Farrell is a miracle in every sense. I will never forget this book." An extraordinary memoir—told entirely in near-death experiences—from one of Britain's best-selling novelists, for fans of Wild, When Breath Becomes Air, and The Year of Magical Thinking. "Heart-stopping... 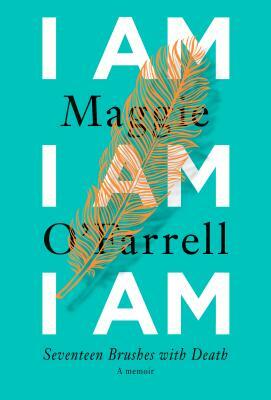 Genius... Maggie O'Farrell turned 17 near-death experiences into a literary masterwork "
"With stunning language and inventiveness, Maggie O’Farrell unpacks these moments...so brilliantly, uncovering in the particulars of each those shining, universal experiences, that they are a pleasure to read. And, indeed, difficult to stop reading... There are echoes of Virginia Woolf not just in the rhythm of the prose but also in its dreamlike immediacy. The effect, ingeniously, is of a life told through the gaps, those near misses, on the eluding of which the rest of life hangs." "As its title suggests, [I Am, I Am, I Am's] pounding pulse is ultimately life-affirming. It's an extraordinary book, a reminder that while life has its limits and can be unpredictable, we should push against limitations and not give in to fear. It is also, like O'Farrell's seven intricately constructed, blissfully absorbing novels, full of surprises." "Bold... clever and poignant, thought provoking and deeply affective." "Her stories are harrowing, but the purpose of these essays is not to frighten. It is to affirm. She did not die; she lived through all of these experiences and now recounts each one in vivid, fully alive detail — remembering the feeling of the wind in her hair, the roughness of the grass, the jolt of the plane, the sharpness of the machete." "Not a single false moment...What makes this memoir so fine, so special, is not just the power of these brushes with death, but her examination of them...The book is quite intimate in all senses of the word—physically, psychologically, mentally, and emotionally. There is something truly generous about her style. Reading this memoir is like being taken further and further through the layers of a human life down to some mysterious core from which all meaning emanates. It shows us what it means to be vulnerably alive, to digest the seemingly indigestible fact of our mortality. This is a memoir to be cherished."